The Golan Heights is a basaltic plateau region in the far northeast of Israel. Its average altitude is 900 m (3,000 ft.) above sea level. At the north of the Heights is Mount Hermon, Israel’s highest peak. To its west are Lake Kinneret and the Hula Valley. Israel secured control of the western two-thirds of the Golan in the Six Day War in 1967, in the course a defensive fight waged after Syria had attacked – among other actions, shelling Israeli civilian areas from the Golan Heights. For years prior to this attack, Syria had used the Golan intermittently to shell Israeli areas below. The Golan has now been under Israeli control for more years than it was in Syrian hands. (The French Mandate for Syria, which began in 1923, included the Golan; Syria held the Golan from the time the Mandate terminated in 1944, until 1967.) The part today controlled by Israel is an area of 12,000 sq. km. (500 sq. mi.). The 1974 Israeli-Syrian Agreement on Disengagement established a buffer zone, with a UN Observer Force, although the presence of the UN has been erratic in recent years because of Syrian unrest. On December 14, 1981, the Knesset passed legislation (63-21) establishing that Israeli Law would apply on the Golan Heights. Syria’s President Assad continued to vociferously claim the area; from time to time there was talk about returning the Golan to Syria in the course of a peace agreement. However, with the Syrian civil war, begun in 2012, the situation deteriorated to one of great instability, and it was clear how disastrous it would be for Israel to relinquish the Golan: Rebels groups moved into the Syrian Golan at various times. Most significantly, both Iran and its puppet Hezbollah have attempted, and continue to make efforts, to set up bases in the Syrian Golan, with intent to hit Israel. Because of its elevation and location the Golan Heights has a strategic significance for Israel far beyond its relatively small size. This is first for security reasons: It would serve as a high-elevation base for attacking Israel. And it would eliminate radar and other sounding stations utilized by Israel. It is additionally because Lake Kinneret is a major source for Israel’s water. The Jordan River feeds the Kinneret from the north, and two of the Jordan River’s main sources, the Dan and the Banias Rivers, rise on the slopes of Mt. Hermon. There is additional seasonal run-off from the Hermon and the Heights that flows to the Kinneret. If that water were diverted it would be a major problem for Israel, and it should be noted that Syria – ultimately stopped by the IDF – made an attempt to divert these waters in 1964. 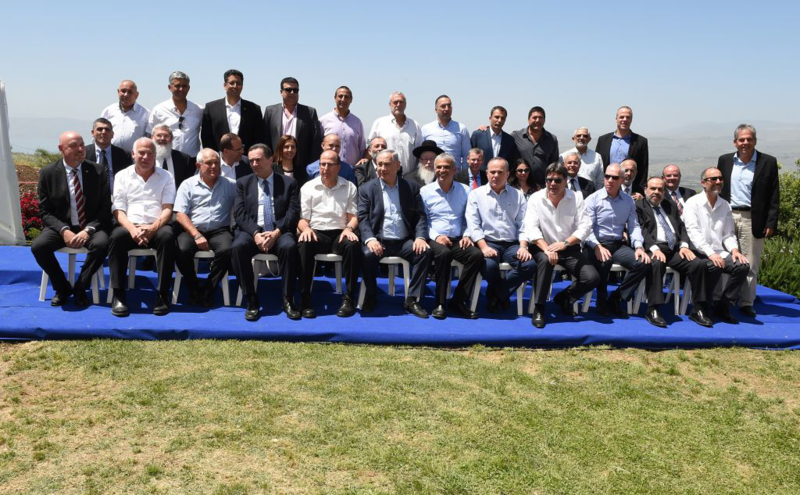 Prime Minister Netanyahu made it clear that Israel had no intention of ever relinquishing the Golan – not as part of a peace agreement or otherwise. In April, 2016, he called a cabinet meeting on the Golan for the very first time to publicly make that point. 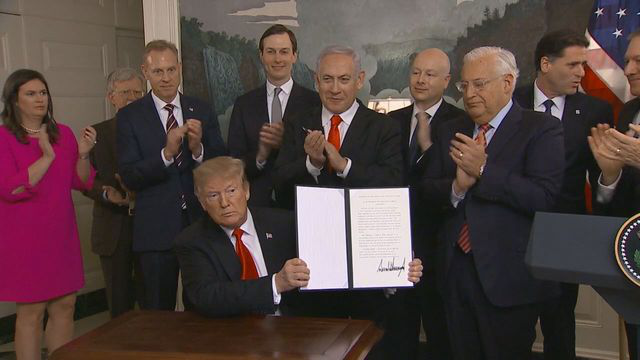 A great diplomatic furor ensued, emanating from politically correct and anti-Israel groups such as the EU and the UN, charging that the president was out of line to recognize Israel’s sovereignty over the Golan. In point of fact, Trump had every right to proceed as he had, just as Israel has every right to remain on the Heights and to retain control of the area. The primary charge by groups objecting to Israel’s sovereignty on the Golan is that this is territory taken in war, which is not permissible. But this charge misses an essential point: There is a difference between land acquired in an offensive war – in which one country aggressively acquires land belonging to another country, and a defensive war – in which a country moves to protect itself and prevent a repeat of an attack. Analyst-commentator Evelyn Gordon has observed that what Trump did was to revive the idea in international law that aggression should not be cost free. There was a time, she says, when the distinction was made between the consequences of an offensive and a defensive war. Citing the introductory clause in Security Council Resolution 242, passed after the Six Day War, that states, “Emphasizing the inadmissibility of the acquisition of territory by war…” she demonstrates how this was intended to apply only to wars of aggression. If there is no distinction, then war becomes, as it were, “cost free”: a country can attack a neighbor, lose land in the process, and then when it’s over, demand that the land be returned. 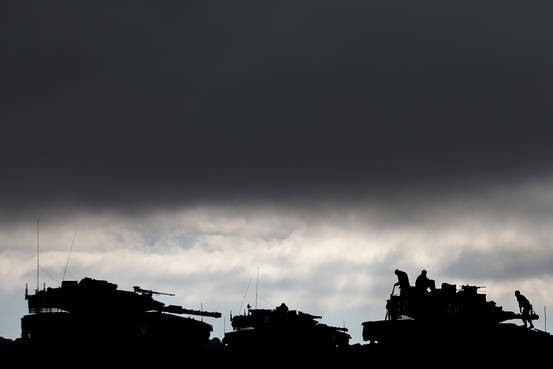 “By recognizing Israeli sovereignty over the Golan, Trump is restoring the distinction that used to exist between offensive and defensive wars, and thereby restoring international law to sanity. Anyone who actually cares about international law ought to thank him. Ambassador Dore Gold, President, Jerusalem Center for Public Affairs, addresses the same issues, and makes the same arguments, in a more extensive examination. He cites Stephen Schwebel, who served as president of the International Court of Justice in The Hague, and other legal authorities on this. Has any European country ever handed over high ground, captured in a defensive war, to a sworn enemy? Recall that at the end of the first and second world wars, European countries made territorial adjustments to help preserve the peace. Why should the European Union subject Israel to a double standard it has never demanded of itself?The answer is clear: The European Union has always acted hypocritically when it comes to Israel, and this is no exception. In Biblical times, the Golan Heights was referred to as “Bashan,” an area assigned to the tribe of Manasseh (Joshua 13:29). Golan was a city of refugee within Bashan (Deuteronomy 4:43). In the late Sixth and Fifth Centuries BCE, Jewish exiles returning from Babylon settled in the Golan. Jewish communities continued to exist there, as Judah Maccabee and his brothers come to their aid when they were attacked by non-Jewish neighbors (I Maccabees 5). The Hasmonean King Alexander Jannai (reigned 103-76 BCE) later added the Heights to his kingdom. Gamla, the primary Jewish city of the Golan, was the last stronghold to fall to the Romans in the Great Revolt of 125CE. Jewish life on the Heights continued, however: no less than 25 synagogues have been excavated from the time of that fall until the Islamic conquest of the area took place in 636. At that point Jewish life on the Golan came to a halt. Jewish presence was then renewed beginning in the late 1800s, as various groups and societies purchased plots of land. Life there was difficult to sustain however, in the face of anti-Jewish aggression – expulsions, pogroms. There are 32 Jewish communal settlements of various sorts (kibbutzim, moshavim, etc.) as well as the town of Katzrin). There has been a good deal of agricultural development – notably grapes that produce excellent wines, and pasturage for cattle and sheep. There are 13 nature preserves, ski lifts on Mt. Hermon, and numerous archeological sites. Previous articleWill Trump’s ‘deal of the century’ lead to change?